JyothishaDeepthi Vedic English Indian Astrology Software with Horoscope in English, Panchangam, Transit/Star/Rise/Set Tables, Calendars, Porutham (Matrimonial Match). This Software is suitable for those who are interested in or practicing Astrology.This English Astrology Android App provides 200 years, Saka ,English,Tamil& Malayalam Calendars, Monthly Panchangam,Jathakam, Matrimonial compatibility and many more calculations specially developed for Astrologers. 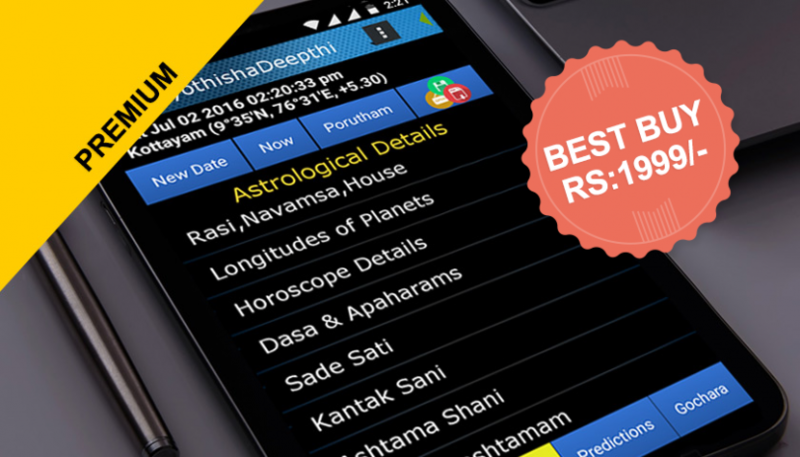 JyothishaDeepthi Panchangam is the Most Trusted astrology software in South India. 13 Ayanamsas including User Defined Ayanamsa. Horoscope with predictions (Jathakam in Malayalam)(PDF format). Matrimonial Compatibility reports (PDF format). Given any Date find Next/Previous Transit for any planet. Transit Table of any planet for any date range. 14 Days Free Trial with full features enabled (except PDF) and 180 days Grace Time While On Net. Free usage for years from 1996 to 2016. To avail Free trial and grace time, open the software with INTERNET ON for the first time after installation.